Downey Daily Photos: Coming soon! They're everywhere! 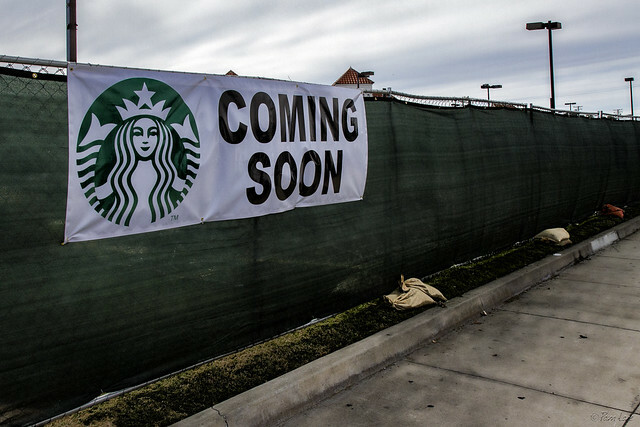 But that doesn't mean I'm not happy to see this Starbucks rising from the parking lot within walking distance of my house. It's just far enough to help me resist the temptation to go too often. And it's just far enough to be a good walk to balance my morning snack. "I saw a guy at Starbucks yesterday. No iPhone, no tablet, no laptop. He just sat there drinking coffee, like a psychopath."